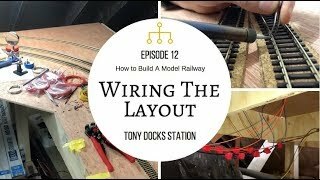 This video shows you how to wire up your DCC layout. I cover everything from bus wires, to soldering and dropper wires. I also talk through how to connect up the electrofrog points to your wiring. In this series, I am showing you my progress of building a model railway in the loft. From the very start of converting the loft into a useable space, right through to the continuous building of the layout. I hope you enjoy the video and find it useful in some way. Please feel free to comment and subscribe, thank you!